Yesterday, I included a sign from our photo contest, and a couple of people responded that the sign made complete sense to them because garbage and trash are different things. I’d never heard this—I call all of my refuse “garbage”—and thought that maybe it is a difference depending on the area of the U.S. that we’re from. It turns out that there’s all sorts of information on rubbish out there! [uncountable noun] This is British English (BrE). British people throw away rubbish. [uncountable nouns] American English (AmE) – Americans throw away garbage and trash. trash is things like paper and packaging – ‘dry’ materials. [uncountable noun] This is not household waste. Litter is small things such as cans, bottles and paper that people leave lying on the streets and in other public places. I was still a bit uncertain about the difference between trash and garbage, so I thought I’d see if there are regional differences in the words we use. 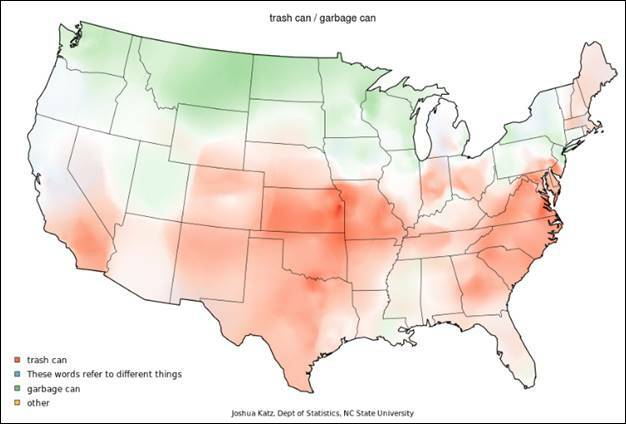 I didn’t find anything on that exact topic, but I did find this map that shows the regional differences between the use of trash can and garbage can. 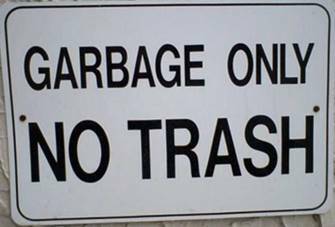 I guess it makes sense that I say garbage, since I grew up in Washington state. Does this make sense according to the terms you use and where you’re from? I hope so!